The Blastobasidae are a family of moths of the superfamily Gelechioidea. The members of this species can be found almost anywhere in the world, although in some places they are not native, but introduced by humans. 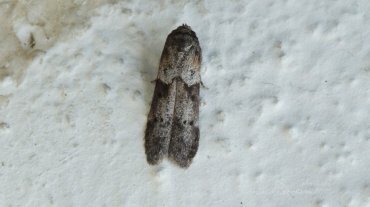 The classification is not unanimous and often, these moths are included in Coleophoridae as subfamily Blastobasinae. Adults are usually small, thin moths at a glance is a lack of a clearly visible As noted by the entomologist Edward Meyrick once described the group as "colored moths obscure and boring, definitely the least attractive of the family of moths. "Their color is generally reddish brown, without streaks sharp or large spots on the wings. The head is smooth, with moderately long antennas, which are each located on the middle of the head. Wingspan in this family varies from 12 to 24 mm, more than ten times as much than is large the chest.